Mitochondria (figure 1) are essential organelles in modern eukaryotic cells and play a key role in bulk ATP production, calcium ion storage, fatty acid oxidation and iron-sulfur cluster biogenesis. Moreover, impairment of mitochondrial function is tightly associated with ageing and different human diseases such as cancer and a variety of neurodegenerative disorders. 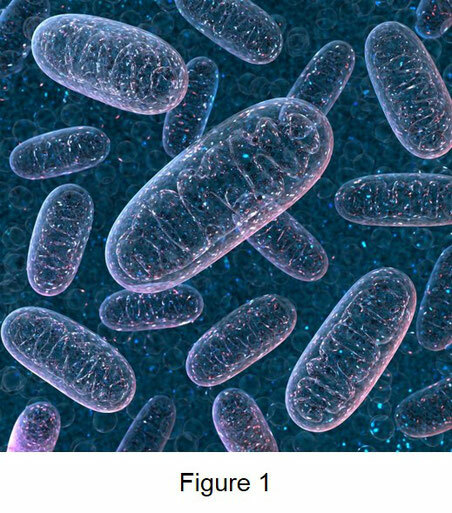 The story of mitochondria began about 1.5 billion years ago when, according to the endosymbiotic theory, an α-proteobacterium was taken up by a primordial eukaryotic cell (1). During evolution, mitochondria retained two phospholipid membranes known as the outer and inner membrane. These segregate the intermembrane space and matrix, two aqueous compartments. 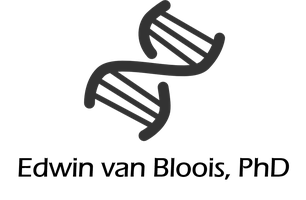 Although the vast majority of the mitochondrial genes were transferred to nucleus, most mitochondria still possess a small genome. This encodes for 13 proteins in human mitochondria and eight in baker’s yeast and these mainly comprise essential subunits of respiratory complexes (1). Consequently, nearly all mitochondrial proteins are produced in the cytosol and are subsequently imported into the organelle through specialized translocases in the outer and inner membrane. Thus, the mitochondrial proteome is of dual genetic origin and comprises about 1500 polypeptides. The quality of the proteome is crucial for proper mitochondrial activity (2). To maintain a functional proteome, damaged proteins are degraded and replaced by with new ones. It has been shown that under non-stress conditions about 5% of the mitochondrial proteome is degraded in logarithmically growing yeast cells, demonstrating that the proteome is constantly renewed (3). However, most of the mitochondrial proteome is not accessible for cytosolic degradation pathways. Its quality is, therefore, monitored by mitochondrial chaperones and proteases. Mitochondrial AAA proteases are a key component of the quality control system. These represent a group of conserved ATP-dependent proteolytic enzymes that belong to the AAA+ superfamily and are found throughout all domains of life (4,5). These enzymes typically use the energy of ATP hydrolysis to power a variety of functions, including protein folding and unfolding. Five AAA proteases have been identified in mitochondria. These include LON protease and mtClpXP that prevent the accumulation of protein aggregates in the matrix compartment through degrading denatured and oxidatively damaged proteins. Moreover, the inner membrane houses two AAA protease complexes known as i-AAA and m-AAA, respectively, that degrade unassembled, misfolded and damaged proteins in the inner membrane. In yeast, the m-AAA protease is a heterooligomeric complex made up of two different subunits, Yta10 and Yt12. On the other hand, the i-AAA protease is a homooligomeric complex composed of a single subunit, Yme1. Both proteases are related to FtsH, which is another AAA protease found in the bacterial cytoplasmic membrane and chloroplast thylakoid membrane. The catalytic domains of the i-AAA and m-AAA proteases are exposed to opposing sides of the inner membrane. The i-AAA protease is active in the intermembrane space, while the m-AAA protease displays activity in the matrix (4,5). Moreover, accumulating evidence shows that these enzymes control key biochemical processes such as mitochondrial biogenesis and stress responses through specific proteolysis of regulatory proteins. It is therefore not surprising that a decrease in mitochondrial AAA protease activity is associated with neurodegeneration, metabolic syndromes and cancer in humans (6). Structural information of these proteases is therefore crucial to assess their mechanism and to design potential therapeutic agents. 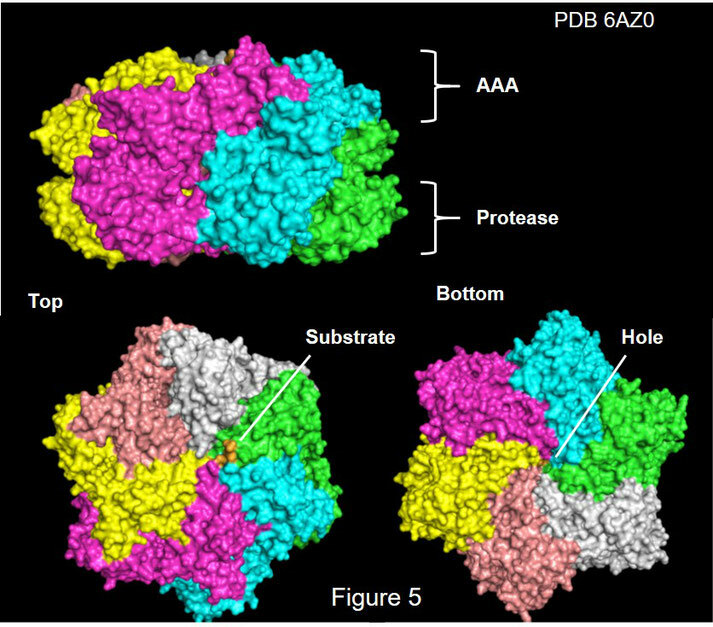 Recent structures of the i-AAA and m-AAA proteases revealed their structural organization and offered profound mechanistic insight into substrate processing (7,13). Here, I will discuss these novel structures as well as how these enzymes handle substrate proteins. The mitochondrial inner membrane is considered to be the most protein rich biological membrane. In fact, it has been estimated that the inner membrane contains up to 40% of the total mitochondrial proteome as it is remarkable abundant in respiratory chain complexes for oxidative phosphorylation, carrier proteins for small molecule transport and protein complexes that facilitate protein import (2). Most respiratory chain complexes are made up of nuclear and mitochondrially encoded subunits and their proper assembly is a crucial step to obtain a functional complex. If assembly fails, subunits accumulate in the inner membrane without their partner, a potential detrimental event. Owing to the presence of respiratory chain complexes, the inner membrane is the primary site for the formation of reactive oxygen species that will unspecifically damage inner membrane proteins. Thus, within the inner membrane there are many hazards that will contribute to protein misfolding or damage. Monitoring the quality of the inner membrane proteome is therefore of critical importance (2). This task is performed by two AAA proteases, i-AAA and m-AAA, embedded into the inner membrane (figure 2 adapted from 5). These enzymes are related to FtsH, which comprises a AAA protease in the cytoplasmic membrane of bacteria and choloroplast thylakoid membrane, respectively (8). 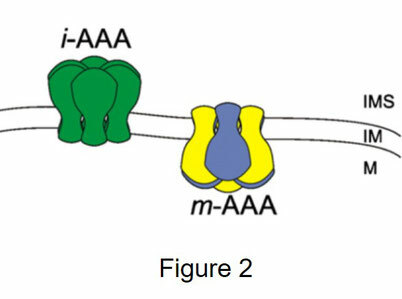 The catalytic domain of i-AAA and m-AAA are located on opposite sides of the membrane with i-AAA being active in the intermembrane space (IMS) and m-AAA in the matrix compartment, respectively (figure 2). In all eukaryotes, the i-AAA protease is made up of six identical subunits e.g. Yme1 in yeast and YME1L in humans (4,5). In contrast, m-AAA is composed of six different subunits such as Yta10 and Yta12 in yeast and AFG3L2 and Paraplegin in humans (4,5). It is now well established that i-AAA and m-AAA fulfill housekeeping functions by damaged, misfolded and misassembled proteins. Important protein substrates include unpartnered subunits of respiratory chain complexes as well as misfolded inner membrane proteins. These are degraded into short peptides that can be released from mitochondria or further proteolyzed into amino acids by mitochondrial oligo peptidases (4,5). Both enzymes display overlapping substrate specificity and probably recognize the folding state of substrate proteins, such as an unstructured, solvent-exposed region of 10 to 20 residues (9, 10). Proteolysis can be initiated from the N or C-terminus as well as internal loops of membrane proteins. It has been shown that i-AAA and m-AAA are able to recognize substrate proteins at opposite sides of the membrane which are subsequently degraded. This, therefore, implies that substrates are extracted from the membrane during proteolysis (10). In addition to their housekeeping role, accumulating evidence shows that these enzymes control key biochemical processes such as mitochondrial biogenesis, protein import and stress responses through specific proteolysis of regulatory proteins. This includes maturation MrpL32 by m-AAA, a nuclear encoded subunit of the mitochondrial ribosome, thereby controlling mitochondrial protein expression as well as processing of the outer membrane located mitophagy receptor protein, Atg32, by i-AAA, initiating mitochondrial degradation and cooperation between i-AAA and the translocase complex of the inner membrane, TIM23, thereby facilitating import of proteins into the intermembrane space (4,5). Moreover, it was recently shown that Yme1 is able to fold proteins in the intermembrane space, unveiling a novel role for this enzyme as folding assistant in this compartment (11). Yme1, therefore, probably occupies a central position in a complex network that controls mitochondrial physiology. All FtsH-related AAA proteases are organized into hexameric, complexes that are embedded in the mitochondrial inner membrane, chloroplast thylakoid membrane, or bacterial cytoplasmic membrane, respectively. These proteolytic complexes are made up of conserved subunits. Each subunit is a single polypeptide with multiple domains (figure 3 adapted from 5) and can be divided into a short N-terminal mitochondrial targeting sequence (MTS), which is followed by an N-terminal domain (ND) that contains the membrane spanning-regions. Subunits of i-AAA contain one transmembrane domain (TM), while subunits of m-AAA contain two transmembrane domains. The ND is followed by a conserved AAA module that is characterized by the presence of two ATP-binding sites, Walker A and B (WA and WB) motifs, as well as two pore loops (PL1 and PL2). Moreover, this module contains the intersubunit signaling motif (ISSS) and a conserved stretch of amino acids that is known as the second region of homology that is equipped with an arginine finger (R). Next to the AAA module, is a metalloprotease domain (PD) with an active site that encompasses a conserved Zn2+ binding motif (His-Glu-X-X-Glu). At the C-terminus of the protease domain are helices (CH) involved in substrate binding (4,5). Several lines of evidence have established that AAA+ proteases are assembled into a cylindrical-like structure with a hexameric ring made up of AAA modules on top of a barrel-shaped protease (12). The cryo-EM structure of the intact yeast m-AAA protease at moderate resolution (figure 4) revealed that the AAA modules are arranged into a hexameric ring attached to pore-like protease with a central channel protruding from the AAA ring into the proteolytic barrel, which is probably used for the translocation of unfolded substrate proteins into the protease chamber (13). Moreover, the transmembrane domains are clustered into a bundle that is situated on top of the AAA ring. Thus, the overall structure of yeast m-AAA is similar to that of other proteases of the AAA+ family with a hexameric AAA ring connected to a proteolytic chamber (12). Though valuable, the moderate resolution of this structure precludes accurate assessment of the Yta10 and Yta12 subunits and, moreover, does not provide molecular insight into the catalytic mechanism of the m-AAA protease. Recently, however, the structure of the yeast i-AAA protease lacking the transmembrane region but bound to a substrate peptide was determined by cryo-EM at 3.4 Å in the presence of ATP (7). This atomic model is shown in surface representation in figure 5, revealing an overall hexameric structure (top panel) comprising an AAA ring and a protease ring that are stacked on top of each other. The structural organization of i-AAA is, therefore, similar to that of other AAA+ proteases (REF). Importantly, the hexameric AAA ring contains four ATP molecules, while the Yme1 subunits are arranged into a spiral staircase with each AAA module in a different orientation. A top view of the enzyme is presented in the left bottom panel and shows an additional density (in orange) within the axial pore of the AAA ring that probably represents a substrate peptide that is trapped during translocation through the Yme1 pore. A bottom view of i-AAA is shown in the right bottom panel and clearly reveals a central hole of the proteolytic chamber that is probably used for the release of proteolytic fragments. 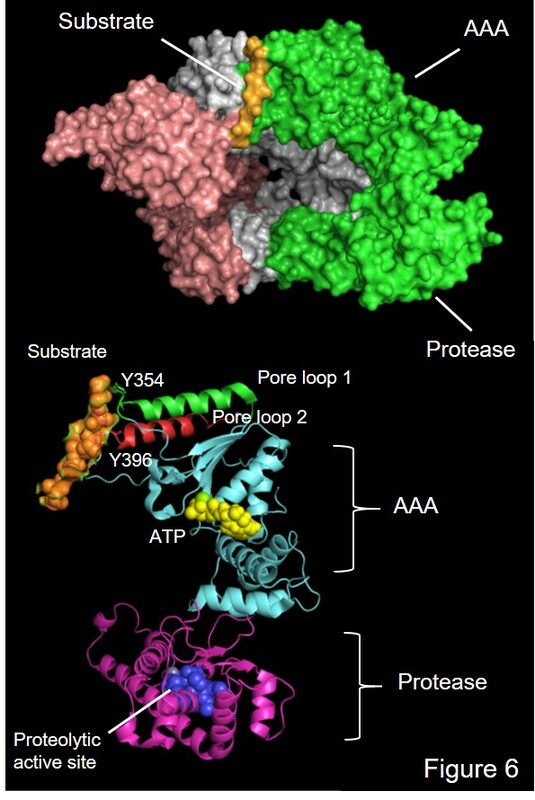 A cutaway view of the enzyme is provided in the top panel of figure 6 and clearly shows the substrate peptide in the axial pore of the AAA ring. This pore has a diameter of about 1.4 nm, which is sufficient to accommodate an unfolded peptide. Moreover, the substrate peptide is indirect contact with different AAA modules. A ribbon diagram of a single Yme1 protomer is presented in the bottom panel of figure 6 with the AAA and protease domains indicated, the substrate peptide is shown in orange, bound ATP as yellow spheres, and the proteolytic active site as blue spheres. It has been established that conserved tyrosines in pore loops of AAA+ proteases are directly involved in substrate unfolding and translocation. The structure of Yme1 reveals that tyr 354 of pore loop 1 directly contacts the substrate peptide. These tyrosine residues of the different subunits are arranged in a spiral staircase fashion throughout the AAA ring. Some of these residues are associated with the substrate, while others are not in contact with the substrate. Conceivably, the use of a second tyrosine residue contributes to the protease’s grip on hydrophobic regions of substrate proteins during extraction of the membrane. The orientation of the AAA module determines which tyrosine 354 residue associates with the substrate peptide. Interestingly, a tyrosine residue of pore loop 2 (tyr 396) also contacts the substrate and these residues are similarly organized throughout the AAA ring as tyr 354. Although this residue is conserved amongst Yme1 homologs, it is not found in other AAA proteases. Replacement of these tyrosine residues with alanine impairs the protease activity of Yme1, demonstrating that these residues are functionally important. Moreover, the Yme1 structure reveals different nucleotide states, namely: four subunits are loaded with ATP, while one subunit contains ADP and another is unliganded. Thus, the enzyme exhibits three distinct nucleotide states. Remarkably, these correspond with the interaction states of the pore loops e.g. the ATP bound subunits directly interact with the substrate, the ADP loaded subunit only weakly interacts with the substrate and the subunit devoid of nucleotide does not contact the substrate. It seems therefore that ATP hydrolysis induces reorganization of the subunits, thereby controlling pore loop movements that mediate substrate interaction and drive substrate translocation. It is, however, not clear what triggers ATP hydrolysis. Conformational changes within the AAA ring do not induce structural changes of the protease ring. 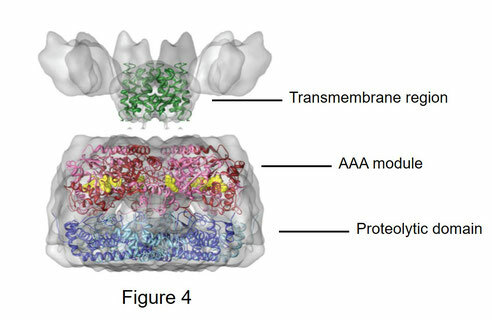 In sum, movements within AAA modules facilitate translocation of an unfolded substrate through the pore of the AAA ring into the hydrophilic chamber of the protease ring with all six protease sites facing the interior of the chamber. The structural data discussed above show that ATP hydrolysis controls conformational changes within the AAA modules and thereby pore loop movements that mediate substrate interactions. A model for sequential ATP hydrolysis that proceeds counterclockwise around the AAA ring is presented in figure 7 (adopted from 7). ATP hydrolysis in the lower most AAA module of the staircase induces a conformational change that weakens the interaction of the pore loop tyrosines with the substrate. These movements trigger ATP hydrolysis in the counterclockwise neighboring subunit. Following ATP hydrolysis, the interaction of this subunit with the adjacent ADP loaded subunit is lost. Thus, this subunit has as this stage lost contact with its neighboring subunits. Next, the ADP bound subunit releases ADP, thereby dissociating from the substrate. Subsequent binding of ATP reestablishes the contact with the adjacent ATP bound subunit. Repeating these events lead to a sequential ATP hydrolysis cycle that proceeds around the AAA ring in a counterclockwise direction. The ATP loaded subunits bind the substrate, while the ADP bound subunits release the substrate at the lowest point of the staircase. The unliganded subunit moves to the highest position of the staircase where it reattaches to the substrate following ATP binding. The unfolded substrate is translocated via this mechanism into the proteolytic chamber were it is ideally positioned for hydrolysis at the protease active sites. Figure 8 (adopted from 7) details a potential mechanism of how ATP-induced conformational changes drive substrate translocation. A translocation cycle is initiated by return of the unliganded AAA module to the top of the staircase, which subsequently binds ATP and associates with the unfolded substrate through its pore loops. Adjacent subunits sense the presence of ATP through their arginine fingers and ISS motif that connects subunits across the ATP binding site. Attachment of the ISS to the ATP bound subunit pushes the pore loop tyrosines towards the substrate, ensuring that these residues interact tightly with the substrate. ATP hydrolysis releases the arginine fingers, which induces disassociation of the ISS and repositioning of the pore loops away from the substrate. A glycine residue in the linker that connect the AAA module and the protease domain enables large movements of the AAA modules within the staircase. ATP hydrolysis in the subunit at the bottom of the staircase induces hydrolysis in the next lowest ATP containing subunit. 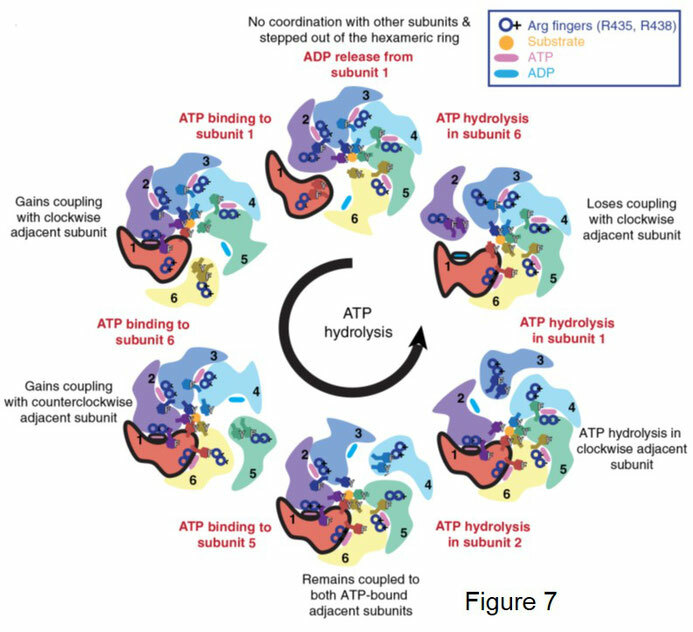 Release of ADP breaks the contact with neighboring ATP bound subunits and displaces the subunit from the hexamer where it can rebind ATP at the top of the staircase. Thus sequential ATP hydrolysis across the AAA ring ensures that the substrate is translocated across adjacent AAA modules into the proteolytic chamber. Proper mitochondrial function is crucial for cell viability because impairment of mitochondrial activity is detrimental for overall health. In humans, for example, a decline of mitochondrial function is related to ageing as well as different diseases such as cancer and a plethora of neurological disorders (6). The mitochondrial inner membrane houses respiratory chain complexes for oxidative phosphorylation, carrier proteins for small molecule transport and protein complexes that facilitate protein import (2). Moreover, it has been estimated that the inner membrane contains up to 40% of the total mitochondrial proteome and it is therefore not surprising that maintaining the quality of the inner membrane proteome is essential for safeguarding mitochondrial activity. Two AAA proteases, i-AAA and m-AAA, embedded into the inner membrane play a key role in the quality control of membrane proteins as well as regulatory proteins (4,5). These enzymes are related to FtsH, which comprises a AAA protease in the cytoplasmic membrane of bacteria and choloroplast thylakoid membrane, respectively (8). Both proteases have an opposite topology, namely: i-AAA is anchored to the membrane via one TMD with its catalytic domain facing the IMS, while m-AAA contains two TMDs and exposes its catalytic domain into the matrix component. Owing to the opposite orientation of their catalytic domains, these enzymes are able to engage with substrate proteins on different sides of the inner membrane and thereby control protein quality and key biochemical pathways (4,5). Recent cryo-EM structures of i-AAA and m-AAA revealed that both proteases are made up of an hexameric AAA ring connected to a proteolytic chamber (7,13). These proteases are, therefore, structurally similar to other AAA+ proteases. Moreover, the high-resolution structure of i-AAA provided detailed insight into the molecular mechanism of substrate processing that is probably conserved across all AAA+ proteases. 2. Baker MJ, Tatsuta T, Langer T. 2011. Quality control of mitochondrial proteostasis. Cold Spring Harb Perspect Biol. 1;3: a007559. 3. Augustin S, Nolden M, Müller S, Hardt O, Arnold I, Langer T. 2005. Characterization of peptides released from mitochondria: evidence for constant proteolysis and peptide efflux. J Biol Chem. 280: 2691-2699. 4. Glynn SE. 2017. Multifunctional Mitochondrial AAA Proteases. Front Mol Biosci. 4:34. 5. Gerdes F, Tatsuta T, Langer T. 2012. Mitochondrial AAA proteases--towards a molecular understanding of membrane-bound proteolytic machines. Biochim Biophys Acta. 1823: 49-55. 6. Quirós PM, Langer T, López-Otín C. 2015. New roles for mitochondrial proteases in health, ageing and disease. Nat Rev Mol Cell Biol. 16: 345-359. 7. Puchades C, Rampello AJ, Shin M, Giuliano CJ, Wiseman RL, Glynn SE, Lander GC. 2017. Structure of the mitochondrial inner membrane AAA+ protease YME1 gives insight in to substrate processing. Science. 358. pii: eaao0464. 8. Ito K, Akiyama Y. 2005. Cellular functions, mechanism of action, and regulation of FtsH protease. Annu Rev Microbiol. 59:211-231. 9. Graef M, Seewald G, Langer T. 2007. Substrate recognition by AAA+ ATPases: distinct substrate binding modes in ATP-dependent protease Yme1 of the mitochondrial intermembrane space. Mol Cell Biol. 27:2476-2485. 10. Leonhard K, Guiard B, Pellecchia G, Tzagoloff A, Neupert W, Langer T. 2000. Membrane protein degradation by AAA proteases in mitochondria: extraction of substrates from either membrane surface. Mol Cell. 5:629-638. 11. Schreiner B, Westerburg H, Forné I, Imhof A, Neupert W, Mokranjac D. 2012. Role of the AAA protease Yme1 in folding of proteins in the intermembrane space of mitochondria. Mol Biol Cell. 23: 4335-4346. 12. Nyquist K, Martin A. 2014. Marching to the beat of the ring: polypeptide translocation by AAA+ proteases. Trends Biochem Sci. 39: 53-60. 13. Lee S, Augustin S, Tatsuta T, Gerdes F, Langer T, Tsai FT. 2011. Electron cryomicroscopy structure of a membrane-anchored mitochondrial AAA protease. J Biol Chem. 286: 4404-4411.